What would you do if you had a machine to catch a thief? If you were a cor­rupt Chinese bureau­crat, you would want to ditch it, of course. Resistance by gov­ern­ment offi­cials to a ground­break­ing big data exper­i­ment is only one of many chal­lenges as the Chinese gov­ern­ment starts using new tech­nol­o­gy to nav­i­gate its giant bureau­cra­cy. According to state media, there were more than 50 mil­lion peo­ple on China’s gov­ern­ment pay­roll in 2016, though ana­lysts have put the fig­ure at more than 64 mil­lion – slight­ly less than the pop­u­la­tion of Britain. To turn this behe­moth into a seam­less oper­a­tion befit­ting the infor­ma­tion age, China has start­ed adapt­ing var­i­ous types of sophis­ti­cat­ed tech­nol­o­gy. The for­eign min­istry, for instance, is using machine learn­ing to aid in risk assess­ment and deci­sion mak­ing for China’s major invest­ment projects over­seas. Beijing has been devel­op­ing a nation­wide facial recog­ni­tion sys­tem using sur­veil­lance cam­eras capa­ble of iden­ti­fy­ing any per­son, any­where, around the clock with­in sec­onds. In Guizhou, a cloud sys­tem tracks the move­ments of every police­man with a live sta­tus report. Major Chinese telecom­mu­ni­ca­tion com­pa­nies such as ZTE  have won gov­ern­ment con­tracts to devel­op blockchain tech­nol­o­gy to pre­vent the mod­i­fi­ca­tion of gov­ern­ment data by unau­tho­rised peo­ple or organ­i­sa­tions. 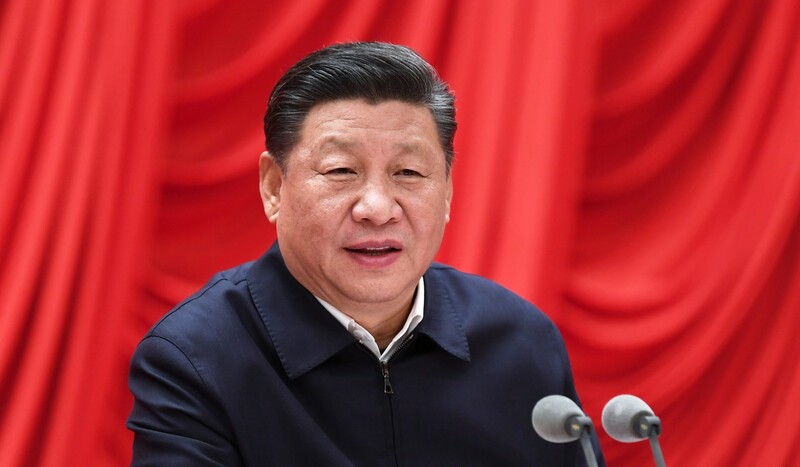 President Xi Jinping has repeat­ed­ly stressed the neces­si­ty of pro­mot­ing sci­en­tif­ic and tech­no­log­i­cal inno­va­tions such as big data and arti­fi­cial intel­li­gence (AI) in gov­ern­ment reform. The chal­lenge is imple­ment­ing that vision on the ground. Look no fur­ther than an anti-cor­rup­tion AI sys­tem dubbed by the researchers work­ing it as “Zero Trust”. Jointly devel­oped and deployed by the Chinese Academy of Sciences and the Chinese Communist Party’s inter­nal con­trol insti­tu­tions to mon­i­tor, eval­u­ate or inter­vene in the work and per­son­al life of pub­lic ser­vants, the sys­tem can access more than 150 pro­tect­ed data­bas­es in cen­tral and local gov­ern­ments for cross-ref­er­ence. According to peo­ple involved in the pro­gramme, this allows it to draw sophis­ti­cat­ed, mul­ti­ple lay­ers of social rela­tion­ship maps to derive behav­iour analy­ses of gov­ern­ment employ­ees. This was “par­tic­u­lar­ly use­ful” in detect­ing sus­pi­cious prop­er­ty trans­fers, infra­struc­ture con­struc­tion, land acqui­si­tions and house demo­li­tions, a researcher said. The sys­tem is not with­out its weak­ness­es, how­ev­er. The sys­tem can imme­di­ate­ly detect unusu­al increas­es in bank sav­ings, for instance, or if there has been a new car pur­chase or bid­ding for a gov­ern­ment con­tract under the name of an offi­cial or one of his fam­i­ly or friends. Once its sus­pi­cions have been raised it will cal­cu­late the chances of the action being cor­rupt. If the result exceeds a set mark­er, the author­i­ties are alert­ed. A com­put­er sci­en­tist involved in the pro­gramme who asked not to be named said that at that stage a supe­ri­or could then con­tact the per­son under scruti­ny and per­haps help him avoid “going down the road of no return with fur­ther, big­ger mis­takes”. The Zero Trust exper­i­ment has been lim­it­ed to 30 coun­ties and cities, just 1 per cent of the country’s total admin­is­tra­tive area. The local gov­ern­ments involved, includ­ing the Mayang Miao autonomous coun­ty in Hunan province, are locat­ed in rel­a­tive­ly poor and iso­lat­ed regions far away from China’s polit­i­cal pow­er cen­tres. Another researcher involved in the pro­gramme said the idea was to “avoid trig­ger­ing large-scale resis­tance among bureau­crats”, espe­cial­ly the most pow­er­ful ones, to the use of bots in gov­er­nance. Since 2012, Zero Trust has caught 8,721 gov­ern­ment employ­ees engag­ing in mis­con­duct such as embez­zle­ment, abuse of pow­er, mis­use of gov­ern­ment funds and nepo­tism. While some were sen­tenced to prison terms, most were allowed to keep their jobs after being giv­en a warn­ing or minor pun­ish­ment. Still, some gov­ern­ments – includ­ing Mayang coun­ty, Huaihua city and Li coun­ty in Hunan – have decom­mis­sioned the machine, accord­ing to the researchers, one of whom said they “may not feel quite com­fort­able with the new tech­nol­o­gy”. None of the local author­i­ties respond­ed to requests for com­ment. Zhang Yi, an offi­cial at the Commission for Discipline Inspection of the Chinese Communist Party in Ningxiang, Hunan province, said his agency was one of the few still using the sys­tem. “It is not easy … we are under enor­mous pres­sure,” he said, insist­ing that the main pur­pose of the pro­gramme was not to pun­ish offi­cials but to “save them” at an “ear­ly stage of cor­rup­tion”. Since Xi rose to pow­er in 2012, more than 1.4 mil­lion par­ty mem­bers and gov­ern­ment employ­ees are esti­mat­ed to have been dis­ci­plined, includ­ing lead­ers like for­mer secu­ri­ty tsar Zhou Yongkang and for­mer Chongqing strong­man Bo Xilai. A par­ty dis­ci­pli­nary offi­cial in Xiushui coun­ty, Jiangxi, who took part in the Zero Trust project said no gov­ern­ment offi­cials were will­ing to pro­vide the nec­es­sary data. “But they usu­al­ly com­ply with a bit of pres­sure,” said the offi­cial, who asked not to be named because of the sen­si­tiv­i­ty of the issue. Disciplinary offi­cials need to help sci­en­tists train the machine with their expe­ri­ence and knowl­edge accu­mu­lat­ed from pre­vi­ous cas­es. For instance, dis­ci­pli­nary offi­cials spent many hours man­u­al­ly tag­ging unusu­al phe­nom­e­na in var­i­ous types of data sets to teach the machine what to look for. Some offi­cials might fab­ri­cate data, but the machine can com­pare infor­ma­tion from dif­fer­ent sources and flag dis­crep­an­cies. It can even call up satel­lite images, for instance, to inves­ti­gate whether the gov­ern­ment fund­ing to build a road in a vil­lage end­ed up in the pock­et of an offi­cial, the researchers said. The sys­tem is still run­ning in Xiushui, but its fate is uncer­tain. Some offi­cials have ques­tioned the machine’s right of access to sen­si­tive data­bas­es because there is nei­ther a law nor reg­u­la­tion autho­ris­ing a com­put­er or robot to do so. No won­der the sys­tem is being decom­mis­sioned by coun­ties and cities that had signed up, and those still using it are fac­ing enor­mous pres­sure, with the researchers see­ing lit­tle or no hope of rolling it out nation­wide. The Zero Trust hump notwith­stand­ing, arti­fi­cial intelligence’s for­ay into oth­er gov­ern­ment sec­tors con­tin­ues as the gov­ern­ment is deter­mined to apply cut­ting-edge tech­nol­o­gy to its advan­tage. AI clerks, for exam­ple, have been recruit­ed in some courts to read case files and help judges process law­suits with high­er speed and accu­ra­cy. Last month, a court in Shanghai became the first ever in China to use an AI assis­tant at a pub­lic hear­ing, Xinhua report­ed. The machine, code-named “206”, has the abil­i­ty to record con­ver­sa­tions, show evi­dence such as sur­veil­lance cam­era footage when men­tioned by lawyers, and com­pare tes­ti­monies to help judges spot dis­crep­an­cies, the report said. One judge was quot­ed as say­ing it would reduce the like­li­hood of a wrong ver­dict. Is China’s cor­rup­tion-bust­ing AI sys­tem ‘Zero Trust’ being turned off for being too effi­cient?